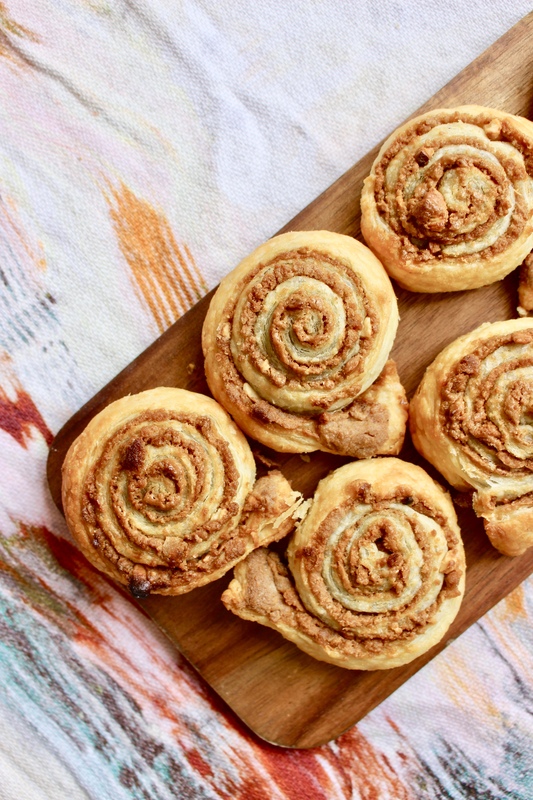 Flakey puff pastry filled with swirls of Biscoff spread, crushed biscuits and roasted cashews! I have always been obsessed with pastries!!! I think I got it from my dad as when I was growing up he would always pop to the supermarket on the weekends after walking the dogs and bring back a whole range of different pastries to have for breakfast! 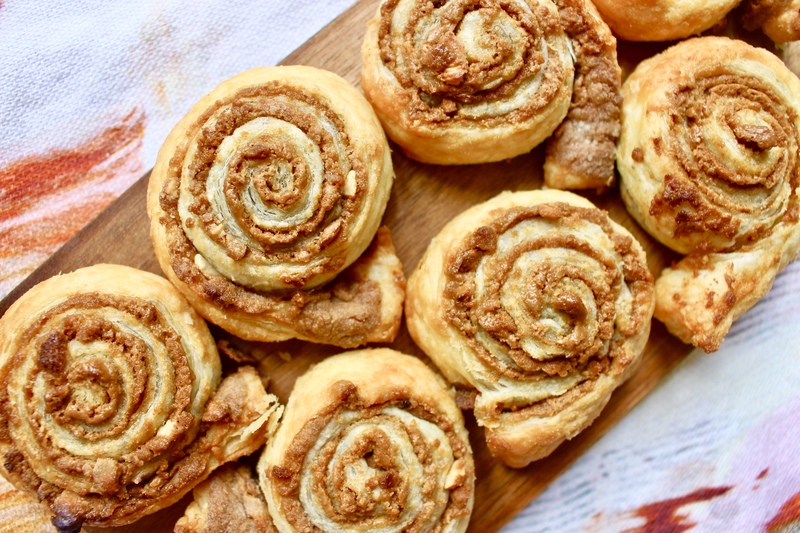 When I first went vegan it was something I really missed, but then I discovered that Jus-Rol puff pastry is accidentally vegan <3 and it has changed everything! Now I can create my own pastry treats so easily! This one was inspired by cinnamon rolls that I am seeing everywhere at the moment. I’m not a massive fan of raisins so I thought I would switch them up and use Biscoff spread instead and add some crushed biscuits and roasted cashews for extra crunch! If you haven’t tried Biscoff Spread yet, get yourself down to your local supermarket and look for some! It’s the best spread ever! Smooth or crunchy caramel biscuits in a spread form *drools*. 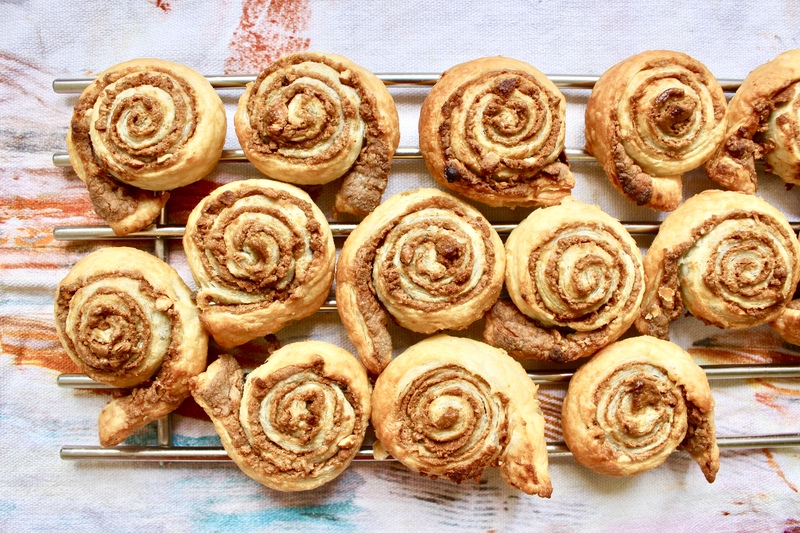 My Biscoff Swirls are a delicious sweet treat to enjoy with a cup of tea at any time of the day. This is a really simple recipe which only requires 4 ingredients and 30 minutes of your time. They are SUPER moorish, so if you can resist eating the lot of them, you can keep them in an airtight container or bag for 2-3 days. Just make sure they cool down completely before sealing them otherwise they may go soggy. I used pre rolled puff pastry to save some time, but you can of course use your own homemade pastry, or roll out a block of it yourself. I used roasted cashews but if you have raw cashews in your kitchen, you can crush and roast them in the oven for about 10 minutes. Unravel your ready rolled sheet and let it stand for 5-10 minutes. Crush your roasted cashews and Biscoff biscuits until they’re chunky but not crumbs. Set them aside. Dust your work surface with flour and take the pastry sheet off the paper. Spread your Biscoff spread evenly on your pastry sheet and top it with your crushed cashews and Biscoff biscuits. Roll the pastry along the short side to form a sausage shape. Using a razor edged knife, cut the pastry into slices about 1 inch wide. 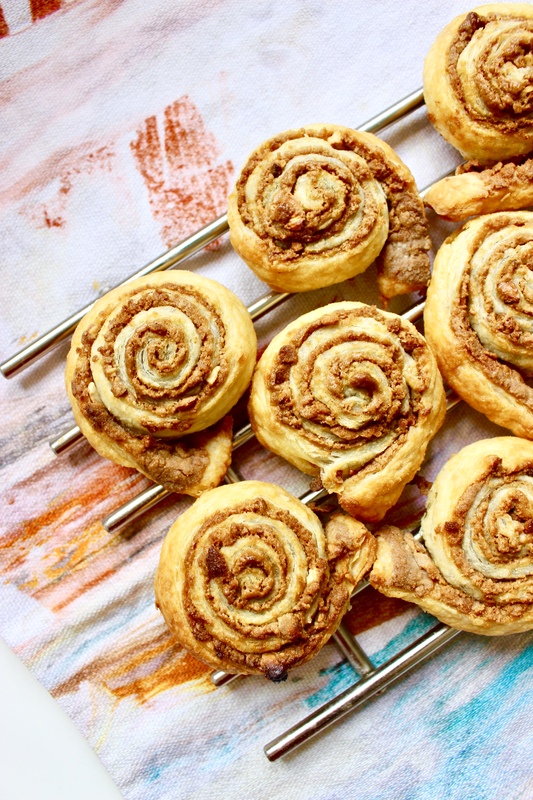 Lay them on your baking tray lined with baking paper, swirls facing up/down. Bake for 12 minutes in the middle of the oven until the puff pastry has expanded and has turned golden brown. Thanks!! Obsessed with biscoff spread, too yummy!